Concentration by the media and commentators on the potential for foul play provided an interesting though morbid fascination while the search operation was in its initial stages. Now that terrorist speculation is reducing, as security and policing investigators are playing down suspicions with respect to passengers who did not board the aircraft, and passengers who travelled with stolen passports. The real concern and need for information revolves around what has happened to the aircraft, and a secondary but equally important need is for an assurance of the quality and timeliness of information released by the airline. The airline is, of course, best placed to inform families of progress, and as previously reported, should be doing so according to ICAO policy. As we initially noted, the media statements issued by the airline have been formulaic and simply transmit information in the form which airline industry groups suggest minimise reputational loss. One of the major rights affected families have is to timely and full information as to the best information the airline has with respect to the whereabouts of the aircraft and its occupants. It is becoming clearer as the days progress, that the information being released by Malaysia Airlines is either, at best, tardy, or perhaps worse, of poor quality or strategically being released in a piecemeal fashion. The Chinese Government is reported to have expressed the same concern, but the airline says everything that can be reported is. Who should families believe? 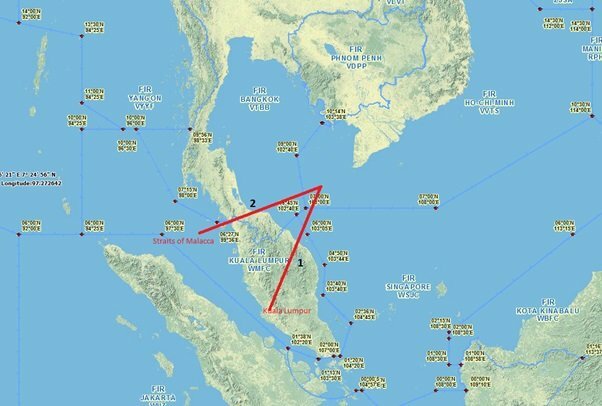 As reported yesterday we noted search efforts had moved to the Straits of Malacca which is west of the (we are told by the airline) last known civilian radar tracked location of the aircraft, or where it was when air traffic control lost contact. We query why the information about a potential U-turn, circle back, or other track deviation was not conveyed to the families and public earlier? Whether it is unconfirmed by the military or not, families should have known the extent of the uncertainty of the location as soon as possible. The lack of information could either have been because Malaysia Airlines did not know that the aircraft had turned and was potentially in another location, or it failed to gather timely information from the entities (such as the military) who monitored it. Either situation paints the information gathered and disseminated by the airline in a poor light. In turn, the lack of evidence of the aircraft triggers uncertainty with respect to the commencement of a full-fledged investigation into the real causes of the accident – uncertainty as to who would be responsible for it (Malaysia; Vietnam; Thailand; Indonesia; or another country if the aircraft is found in international waters). Who would be tracking the aircraft? 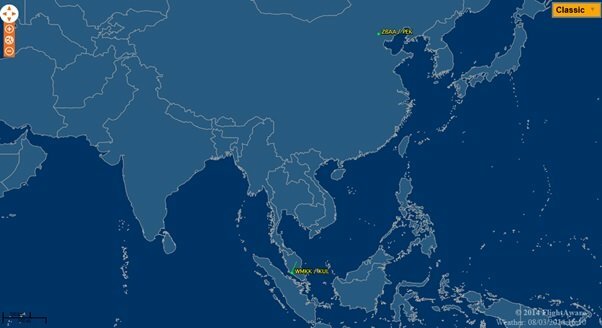 Media reports have been mentioning “air traffic control” and handoffs from Malaysian authorities to Vietnamese. But if one looks at Figure 1 above the authorities involved in the tracking of an aircraft if it had moved west and back over Malaysia, would be numerous and dependent on its location at any time. The chart in Figure 1 sets out the ICAO Flight Information Regions (FIRs) for the airspace over the intended and potential track of the lost aircraft. FIRs are the most basic air traffic services divisions and area control centres (ACCs) provide information and alerting services for each FIR under regional agreements. The services include responsibility for the ACC to alert rescue coordination centres when there is no communication from an aircraft within 30 minutes of when communication should have been received or from the first unsuccessful attempt to establish communication. Originally the aircraft would have headed northeast from Kuala Lumpur (track marked 1), which would have had it potentially traverse Kuala Lumpur control, and Vietnamese control, but potentially also Singaporean control, if the flight path continued as per Flightaware’s 8 March 2014 chart (see Figure 2). Such information has a margin of error as described on Flightaware’s website, so the aircraft could have been further along its track or elsewhere. The airline has not released the aircraft’s flight plan, but military sources are reporting that secondary radar interrogations of the aircraft (which had either a non-functioning or switched off transponder) point to the track headed west. The ACCs would arguably have not had notification of the aircraft’s presence because it appeared its transponder was not sending a squawk code. If this “uncertainty of location” had been admitted earlier, searchers could have targeted their efforts in that area earlier (in the vicinity of the leg marked 2 on Figure 1). Valuable evidence may now be much further from its original location, making investigative efforts more difficult with every passing hour. Furthermore, if the information had been released earlier, inquiries could have been commenced earlier in relation to the recollections or observations of pilots or ship operators transiting the heavily trafficked routes in the Straits of Malacca. This stretch of water is typically flown by aircraft heading for Kuala Lumpur and Singapore and other ports from South Asia, the Middle East and Europe. It is one of the most important shipping lanes and links between the Middle East and Asia. Also, it must be remembered that the aircraft was carrying sufficient fuel to reach Beijing, with reserves in case of diversion to an alternate airport, or holding. As such, it seems overly simplistic that a search region would be identified in the immediate vicinity of the disappearance of voice and transponder/radar contact. In several instances of accidents, hypoxia caused by decompression or lack of air pressurisation in the cabin has accounted for long periods of uncontrolled flying ending in fuel exhaustion and disaster. This was noted by us in our first article on 8 March 2014. In what became known as the “Ghost Flight” a similar situation occurred in 2000 in Queensland Australia. Pilot incapacitation from a lack of oxygen in the air led to the plane flying on for five hours before it crashed from fuel starvation. The Australian Aviation Safety Transport Bureau was unable to determine what incapacitated the pilots, or possibly caused the hypoxic environment in the first place. The culprit may have been gradual decompression as in the Helios accident in 2005. What about safety of Boeing 777s – any cause for doubt? Much has been said and recounted in media with respect to the safety record of the Boeing 777 family of aircraft. While it undoubtedly has a good safety record, the same was said about the Boeing 747, the Boeing 767 and the Boeing 737 in their early lives as airline workhorses, and before the first large losses were recorded resulting in significant refinements to their designs, and which only became apparent after accidents happened. It is notable that there are airworthiness directives, published by the FAA in relation to the B777, and which (according to one of the two potentially significant ADs) were issued to “detect and correct cracking and corrosion in the fuselage skin, which could lead to rapid decompression and loss of structural integrity of the airplane” (AD 2014-05-03). This AD was published 3 days before flight MH370 disappeared, and is expressed to be effective from 9 April 2014. This particular AD was prompted by reports that some B777 aircraft had cracking in the fuselage skin underneath their satellite communication antenna adapters (SATCOMs). The AD calls for repetitive inspections and repairs if necessary, indicating a very likely potentiality for that area to be a weak point in the aircraft’s structure which could permit rapid decompression, if the weakness was not identified and repaired. The AD says that the costs of the extra inspections would be nothing in parts, but up to 36 hours of labour for inspections (ie, $3,060 US per inspection). Another AD was issued on the same date and becomes effective 20 March 2014, (AD 2014-05-05) and while this does not affect the aircraft skin, it does concern the aircraft’s low range radio altimeter (LRRA) operation while the aircraft is flying. The symptoms of erratic LRRA operation can include several dangerous situations including autopilot disconnection, missing ground proximity warning system warnings, large differences between Captain’s and First Officer’s radio altitudes or a negative altitude in the air, and other problems. Such faults have been reported by other operators and could have been the result of micro cracks on certain electrical grounding connections, or certain cable damage. The AD warns that such conditions, if not corrected, could lead to “adverse system responses and flight deck effects that could result in a loss of controllability of the airplane or landing short of the runway during landing”. The FAA issued the AD to “correct the unsafe condition on these products”. The estimate of costs of compliance with the labour is about $170 for two hours work, and about $9,515 if transceivers are needed to be replaced. Antennas cost about 7 hours of work to replace ($595) and $2,703 for the part itself. No event of this magnitude in aviation is the result of any one mistake, omission, or fault. Our intention is not to point the finger at any one potential causative factor. However, the presence of these ADs certainly shows that the aircraft itself is not immune from risk in the air, notwithstanding its safety record thus far. Shine Lawyers Aviation Department shares the concerns of many families about the dearth of information being provided by the airline, notwithstanding the significant search resources being employed. Information is power. While the media statements and press conferences are appreciated, the quality of information being directly transmitted to families must be of a higher quality and more timely. It is arguable that using “caregivers” to provide this sort of information (in addition to emotional support) is not appropriate and that more Malaysia Airlines trained staff should directly liaise with family members, and/or travel to them if they cannot travel to Kuala Lumpur. Shine Lawyers is planning action on behalf of families’ rights under the prevalent ICAO policies on family assistance, if it continues to receive reports that families are receiving inadequate assistance from Malaysia Airlines and the Malaysia Government at this time of uncertainty. Written by Shine Lawyers on March 11, 2014. Last modified: September 26, 2018.